Summons a Familiar for 60 seconds wherever the caster is pointing. Conjure Familiar is a novice level Conjuration spell that summons a Familiar to aid you in combat. It is likely your first summoning spell, particularly if you are a Breton, as this is one of their starting spells. 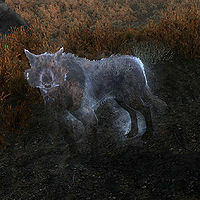 The Familiar appears as a ghostly wolf, and is limited to melee attacks only. Conjuration Dual Casting, multiply spell cost by 2.8 (base 299.6, before reductions) in exchange for increasing the duration to 132 seconds. The Familiar is technically considered a Daedra, which only means that it is subject to Banish Daedra spells. Though it appears as a ghost, it is not undead, and thus not subject to spells that affect the undead. This page was last modified on 12 June 2018, at 13:48.